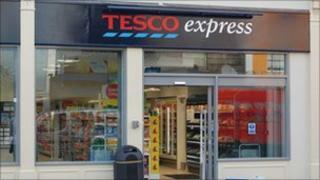 A Tesco Express store that was attacked during a riot in Bristol has reopened. Street clashes broke out on 21 and 22 April in Stokes Croft when police raided a nearby squat after fears the shop was to be petrol bombed. A second disturbance took place a week later, when a protest started peacefully but turned violent. Police, council representatives and a Tesco spokesperson answered questions at a meeting with residents to discuss the disturbances on Monday night. The store reopened at 0700 BST. About 300 people were involved in clashes with police in the street protests over the Easter weekend. More than 160 officers from Avon and Somerset Police and neighbouring forces were involved in the operation. Eight police officers were injured during the clashes. Bins and skips were set alight and the Tesco Express store, which had been open for a week, was attacked and damaged. A week later, another protest took place in Stokes Croft, which saw both police and protesters injured after rocks and missiles were thrown. Officers have arrested 45 people in connection with the disturbances but are still trying to trace more. A judicial review of Bristol City Council's decision to award planning permission to the Tesco store is to take place in Cardiff on 15 June. Councillors approved the plans for the store despite objections from a number of residents. They have claimed the council "failed to follow proper procedure" but Bristol City Council said it felt all the correct planning procedures had been followed. Following the disturbances, hundreds of fans of Bristol graffiti artist Banksy queued to get a limited edition artwork depicting a Tesco Value petrol bomb. An image of the poster had appeared on the elusive artist's website. Banksy fans travelled from across the UK and some said they had queued for hours to buy the poster at a book fair in the city. Proceeds from the sale of the print will go to the People's Republic of Stokes Croft (PRSC) as well as other groups.